Tsunamis, also called seismic sea waves or, incorrectly, tidal waves, generally are caused by earthquakes, less commonly by submarine landslides, infrequently by submarine volcanic eruptions and very rarely by a large meteorite impact in the ocean. Submarine volcanic eruptions have the potential to produce truly awesome tsunami waves. The Great Krakatau Volcanic Eruption of 1883 generated giant waves reaching heights of 125 feet above sea-level, killing thousands of people and wiping out numerous coastal villages. The 1992 Nicaragua tsunami may have been the result of a "slow" earthquake comprised of very long-period movement occurring beneath the sea floor. This earthquake generated a devastating tsunami with localized damage to coastal communities in Nicaragua. Not all earthquakes generate tsunamis. To generate tsunamis, earthquakes must occur underneath or near the ocean, be large and create movements in the sea floor. All oceanic regions of the world can experience tsunamis, but in the Pacific Ocean there is a much more frequent occurrence of large, destructive tsunamis because of the many large earthquakes along the margins of the Pacific Ocean. About two-thirds of the earth is covered by the waters of the four oceans. The Pacific Ocean is the world's largest, covering more than one third of the total surface area of our planet. The Pacific Ocean is surrounded by a series of mountain chains, deep ocean trenches and island arcs, sometimes called a "ring of fire." The great size of the Pacific Ocean and the large earthquakes associated with the "ring of fire" combine to produce deadly tsunamis. In less than a day, these tsunamis can travel from one side of the Pacific to the other. However, people living near areas where large earthquakes occur may find that the tsunami waves will reach their shores within minutes of the earthquake. For these reasons, the tsunami threat to many areas (Alaska, the Philippines, Japan or the U.S. West Coast) can be immediate (for tsunamis from nearby earthquakes taking only a few minutes to reach coastal areas) or less urgent (for tsunamis from distant earthquakes taking from 3 to 22 hours to reach coastal areas). The continents and sea floor that cover the earth's surface are part of a world-wide system of plates that are in motion. These motions are very slow, only an inch or two per year. Earthquakes occur where the edges of plates run into one another. Such edges are called fault lines or faults. Sometimes the forces along faults can build-up over long periods of time so that when the rocks finally break an earthquake occurs. Examples of features produced by forces released along plate edge faults are the Andes Mountains in South America (on land) and the Aleutian Trench near Alaska (under water). When powerful, rapid faulting occurs underneath or near the ocean, a large earthquake is produced and, possibly, a tsunami. The deep ocean trenches off the coasts of Alaska, the Kuril Islands, Russia,, and South America are well known for their violent underwater earthquakes and as the source area for destructive Pacific-wide tsunamis. The tsunami generating process is more complicated than a sudden push against the column of ocean water. 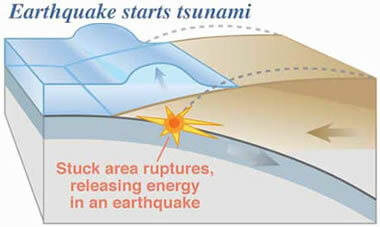 The earthquake's magnitude and depth, water depth in the region of tsunami generation, the amount of vertical motion of the sea floor, the velocity of such motion, whether there is coincident slumping of sediments and the efficiency with which energy is transferred from the earth's crust to ocean water are all part of the generation mechanism.